Another NICOclub exclusive story by David Muramoto! A chill wind throws up tufts of ice crystals against brilliant Colorado sunshine. My boots slip on the slick, icy surface as I make my way out onto the hard-packed slopes. In other instances, I might be getting ready to step into a set of shaped skis to take a few runs at 10,500 feet. 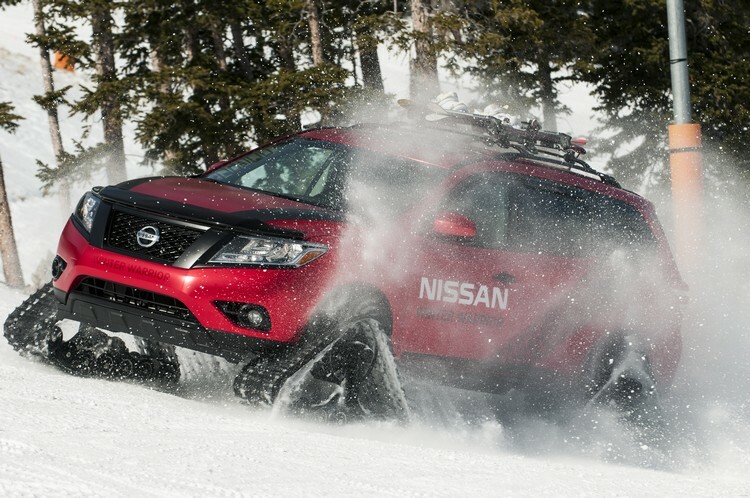 But today is different, as I climb into a slightly modified 2016 Nissan Pathfinder for a few runs UP the ski hill! 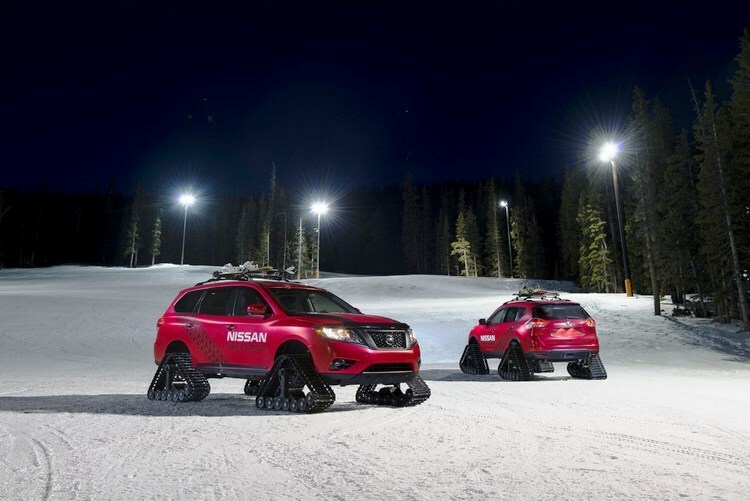 Nissan has brought a brace of their Winter Warrior concept vehicles to the Echo Park ski area for a uniquely Colorado setting to put them through their paces. 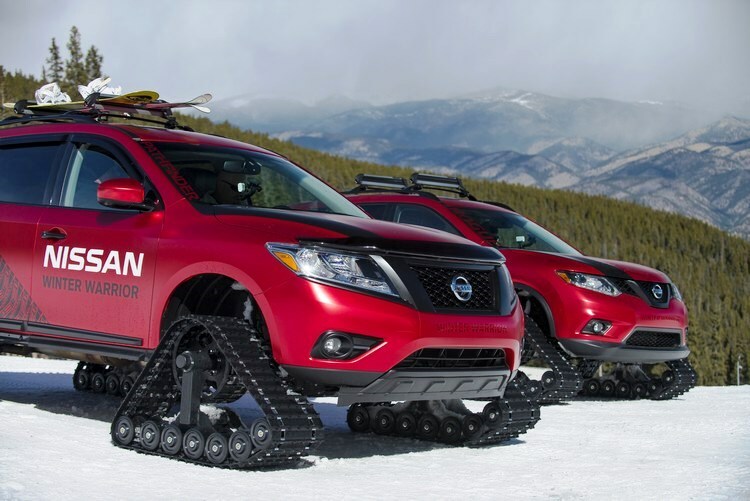 Both the 2016 Pathfinder and the Rogue are cloaked in matte metallic red vinyl designed by Nissan Design America (NDA) for this project. Looks trick- but the real story is what’s sticking out of the wheelwells of both vehicles. 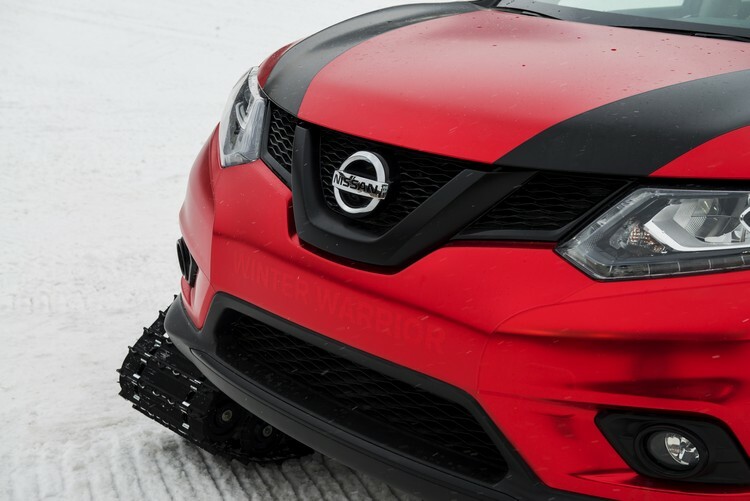 The triangular-shaped Dominator tracks are from American Track Truck and utilize the OEM hubs, brakes and lugs to mount burly 15” wide rubber tank-like treads on both Nissans. The composite fender flares and air dams have been clipped off at the ends to provide extra clearance for the 30” high treads, which spread out to provide a full 48” contact patch at each corner. 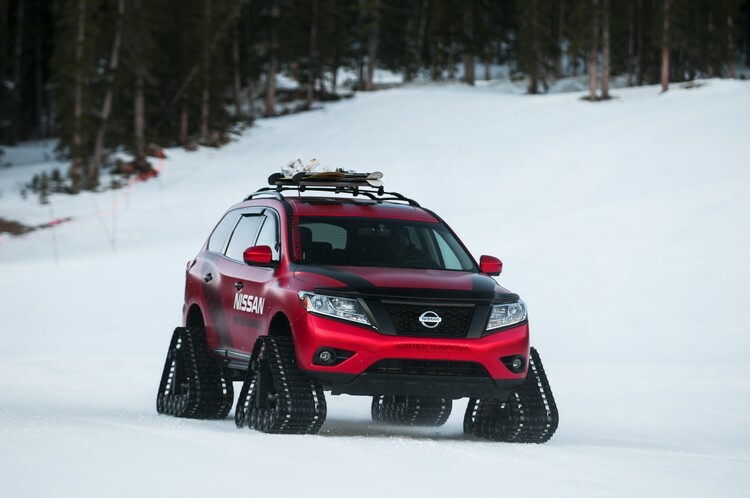 Nissan says this is the only modification made to transform each SUV into a true Winter Warrior. Climbing behind the Pathfinder’s wheel, this is easy to believe, as all the creature comforts and standard controls are present. Pushing the start button, there’s the familiar sound of a VQ35DE whirring to life, and I ease the constant velocity transmission (CVT) into drive. I’ve been warned not to try steering until the huge tracks are in motion, as they have considerable driveline friction. Like an extra in Road Warrior: Fury Road, I give it the gas and rather than facing flamethrowers or spiked obstacles, the Pathy simply flows down the hard packed ski slope. No doubt, with standard all-season tires, I’d be hurdling down this intermediate-level ski slope at breakneck speed to crash into that grove of pine trees at the bottom! But with these $10K tracks on, the AWD Pathy is strictly limited in speed, and 40 MPH feels like we’re flying. These tracks make a lot of noise, with all kinds of squeaking and clatter being augmented by snow flying up off the front and sides of the Pathfinder. Reaching the bottom of the hill, we simply go around a ski lift and start back up. This is where the limits of an aftermarket track system make themselves felt on a VQ35DE-equipped Pathfinder with Nissan’s Xtronic CVT. While grip remained solid, speeds dropped to 20 MPH max. Even using wide open throttle (WOT) made little difference, and turning the wheel even slightly cut that speed down as those tracks used every inch of torque. After a few more runs up to the top of the mountain, I encountered something I’d never experienced before. Going up a particularly steep pitch, the Pathy simply stopped, and while the tach indicated the engine hadn’t stalled, we weren’t going anywhere! WOT or not, we weren’t moving until I put it in reverse and backed slightly down the slope. Taking a slightly different traverse up the slope, the Pathy continued up at barely double digit speeds. First time I’d ever seen what happens when a torquey VQ and CVT meets its match. Nothing broke, or even sounded strained during this stall. Later on, I asked a Nissan engineer if they were monitoring CVT temps, and he simply shrugged and said they were only looking for obvious signs of wear or stress and not found any. Swapping into the identically equipped Winter Warrior Rogue showed many of the same qualities already displayed with the Pathy. Going downhill, lots of tread noise, snow flying and speeds around 35-45 MPH (depending on the terrain). But going uphill, the QR25DE was stressed from the get-go and struggled to move at more than 5-8 MPH at WOT. Mostly, we ran over to the beginner runs and took a shallower route back to the top. There was even an opportunity to play stunt man, as we ran the Pathy and Rogue downhill almost side-by-side as skiers and boarders swooped and carved alongside or behind us (note: Echo Mountain was closed for this event, and these snow riders were area employees who helped film that day). Brakes worked just fine on both Nissans, although there were some reports they could ice up in sub-zero temperatures. Handling was OK, but using stock suspension with both models didn’t exactly inspire a whole lot of confidence when turning a two ton vehicle at the top of a steep slope. To be honest, carving a few turns and feeling the freedom that comes with skiing in Colorado would be my choice when it comes to being a winter (weekend) warrior. And I’d be just as happy to keep the Rogue or Pathy as a fine ride up and back from the mountains.